First of all thank you for coming to my new web site www.grouppolicy.biz this site is still rather new and if you have any issues and/or suggesting please feel free to post a comment. 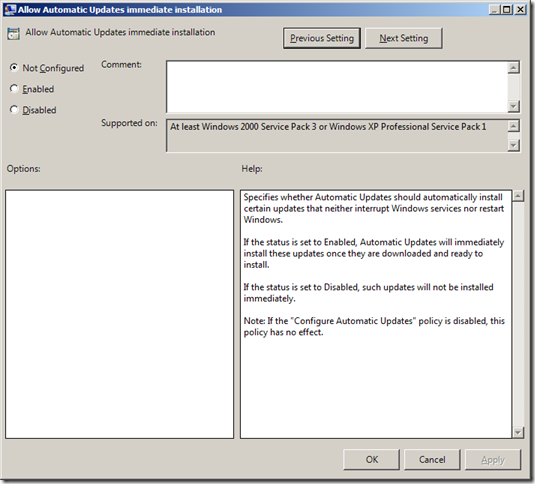 This weeks GPSW covers another product that I use a lot and love to talk about, Windows Server Update Services (a.k.a. WSUS). 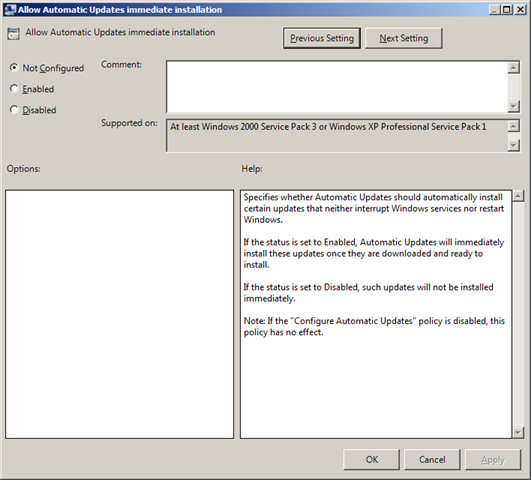 The “Allow Automatic Updates immediate installation” is very handy for deploying non-windows (but still Microsoft) patches from WSUS. While the idea of installing patches in the background of users sound a little scary for an IT administrator there are a couple of benefit in turning this option on. Applying these patches sooner speeds up the deployment of patches and it shortens the length of time needed to install/reboot time of the other patches that do require a reboot of the operating system. Often these types of “no reboot required” patches are for applications (e.g. Office) rather than the OS as these more often require a reboot for them to be applied. One of the few disappointments of Windows 7 was the lack of hot patching that has long been talked about but hey… we can wait and see what Windows 8 brings.